London Olympics bronze medallist Saina Nehwal stormed into the third round of the World Badminton Championships with an easy victory over Natalia Perminova of Russia, in Copenhagen, on Tuesday. The seventh seeded Indian ace needed just 31 minutes to dispose off Perminova 21-11, 21-9. She had a bye in the first round. She will next play the winner of the match between 13th seed Sayaka Takahashi of Japan and Bulgaria's Petya Nedelcheva. Another Indian in the fray in women's singles, 11th seed P V Sindhu will take on Russia's Olga Golovanova in the second round on Wednesday. She too had a bye in the opening round. In the men's singles, Ajay Jayaram progressed to the second round after receiving a walkover from fourth seed and higher-rated Kenichi Tago of Japan. Jayaram will next face Thailand’s Tanongsak Saensomboonsuk, who defeated Scotland's Kieran Merrilees 21-16, 21-17 in his opening round. However, it turned out to be a disappointing outing for Commonwealth Games gold medallist Parupalli Kashyap as he crashed out in the first round of the men's singles after a shocking defeat to Dieter Domke of Germany on Monday night. However, the Indian mixed doubles pair of Arun Vishnu and Aparna Balan crossed the opening hurdle, beating Brazilian combination of Hugo Arthuso and Fabiana Silva 21-12, 21-14. They next take on the sixth seeded German pair of Michael Fuchs and Birgit Michels. The men's doubles combo of Pranaav Jerry Chopra and Akshay Dewalkar eked out a 21-19, 16-21, 22-20 win over Hong Kong's Yun Lung Chan and Chun Hei Lee. The Indian pair will take on fifth seeds Ki Jung Kim and Sa Rang Kim of Korea next. A bullet header from Karim Benzema and a late Cristiano Ronaldo strike allowed Real Madrid kick off their La Liga campaign with a 2-0 victory over newly promoted Cordoba. Benzema struck on the half-hour with a badly needed goal, having only scored once in the previous 15 games. Cordoba did unsettle Real in the second half but Ronaldo hit a trademark 25-yard drive into the corner to settle the game in the final minute. While they beat Sevilla to win the UEFA Super Cup earlier this month, Real were poor during pre-season and were outplayed by Atletico Madrid in the domestic Super Cup, losing 2-1 on aggregate last week. "I have always rated the quality of Karim even though he wasn’t scoring," coach Carlo Ancelotti told a news conference. "It would be more worrying if he were in top condition at this stage as is the same for all. We need to speed up the play more. The most important thing was to start with a win which we did even though we had to suffer. "We controlled the game well and tried to mix possession with more direct play." It was a more attacking Real lineup than then one that took the field against Atletico in the Super Cup with new signing James Rodriguez starting ahead of Xabi Alonso in midfield. After a scrappy start Real began to increase the pressure with Ronaldo and Toni Kroos having shots from the edge of the area which Cordoba keeper Juan Carlos Martin dealt with comfortably. The pressure eventually told when Benzema opened the scoring, with Mike Havenaar going close at the other end from a corner. The visitors made it difficult for Real after the restart and Xisco thought he had found an equaliser midway through the second half but was called offside, before Ronaldo ended any thoughts of comeback late on. Nico Rosberg has questioned Lewis Hamilton's version of events after the Mercedes team mates collided while contesting the lead on the second lap of the Belgian Grand Prix on Sunday. Hamilton told reporters at Spa on Sunday that the Formula One championship leader had told a team meeting after the race that he did it on purpose 'to make a point'. Rosberg, who has dismissed the collision as a racing incident, said on a video blog from Hamburg that he saw it differently. "Definitely one of the more difficult video blogs today," said the German. "I've been told what Lewis said in the press and the way he has stated his version of the events. All I can say is that my view of the events are very different. "The thing is it's just better that I don't now give all the details of my opinion and things like that. I hope you respect that," added the German. "I prefer to just keep it internal." 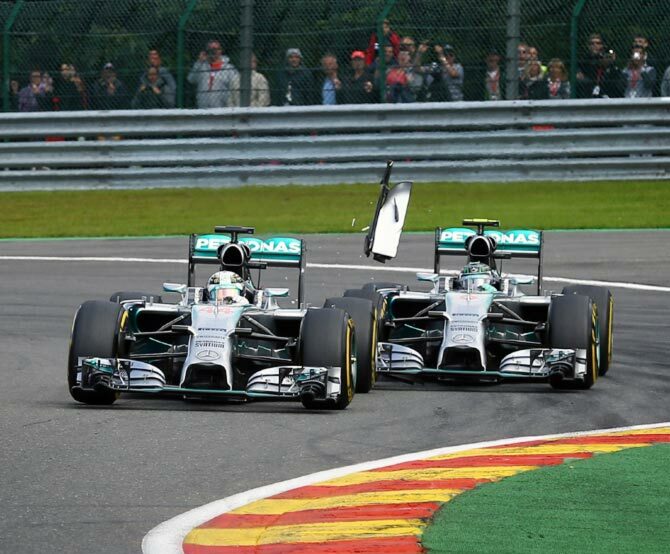 Rosberg left Spa with a 29 point lead over Hamilton, who retired from the race with a damaged floor to his car after picking up a puncture as a result of his team mate's front wing hitting his rear tyre. Mercedes motorsport head Toto Wolff said on Sunday the post-race meeting with drivers had been heated and explained that Rosberg had wanted to show he was not going to back off but had not intended to collide. Rosberg said there had been an "important discussion" with more to come before the Italian Grand Prix at Monza next week. "Now we need to look forward. There will be another discussion for sure because we need to see if we need to change our approach in the future, as we did in Hungary. And we will do that," said the driver. "I'm confident that as always we are going to find back to our way. And then keep fighting in Monza and on we go." Rosberg was blamed by team bosses after the race for causing what was an avoidable collision, although stewards took no action and the governing body is unlikely to take it further. Jenson Button, the 2009 world champion and Hamilton's former team mate at McLaren, was also critical of Rosberg. "I think any driver would look at it (the incident) now, and I'm sure Nico will look at it, and say 'I don't know what I was thinking'," the Briton told reporters. "You should be able to judge situations like that a bit better.